As the season is almost drawing to a close, the days are getting just a little bit shorter. 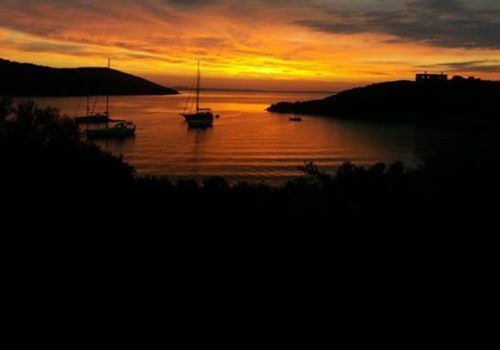 That allowed one of our guests, walking back from the restaurants in the harbour, to take this lovely picture of the sun setting over the gorgeous bay of Syvota. We believe the picture captures the tranquility of the town so very well! The Healthy Options team would like to say a huge thank you to everyone who joined us in Syvota this year and we hope to see you back again in the future. Alexia the manager of Healthy Options in Syvota had this to say about the 2018 season. “It’s always a great pleasure of mine to be running our Syvota Healthy Options centre and 2018 was no exception. We’ve had some really memorable experiences with you all during this summer and it has been a real joy to see the smiles and happiness that our inspiring classes and our weekly trips have given you to take away….. This year we had some new members to our teaching team who were absolutely outstanding in offering professional classes and setting a friendly upbeat tone. We had tons of fun in the Swissball Classes, gaining strength, and endurance in the fitness and discovering more awareness with our breath and body in Yoga and Pilates. We also threw in Greek dance classes for some local flavour. Many guests tried new things and also exceeded their expectations! We had some amazing trips to the Acheron gorge where we walked up the crystal-clear river, marvelled at the surrounding beauty and enjoyed a fun rafting ride down the river. This trip probably being the highlight of the week for most guests! Tranquil paddleboarding around the bay of the Mega Ammos hotel and even witnessing a goat rescue by George our beach guy where he saved a goat from the side of the cliff and brought him back to shore on one of his pedalos! As no surprise, this season brought to us all an opportunity to meet lovely new people and experience all that makes Syvota such a special place. Hospitality and a sense of being looking after is what you always get here in Syvota and we look forward to welcoming our existing and new guests in 2019 to enjoy with us this fabulous location, the great food and company and a welcoming superb team!” Alexia Dranidi. Alexia, Holly, Olympia, Kathi, Kirstie and Melanie.